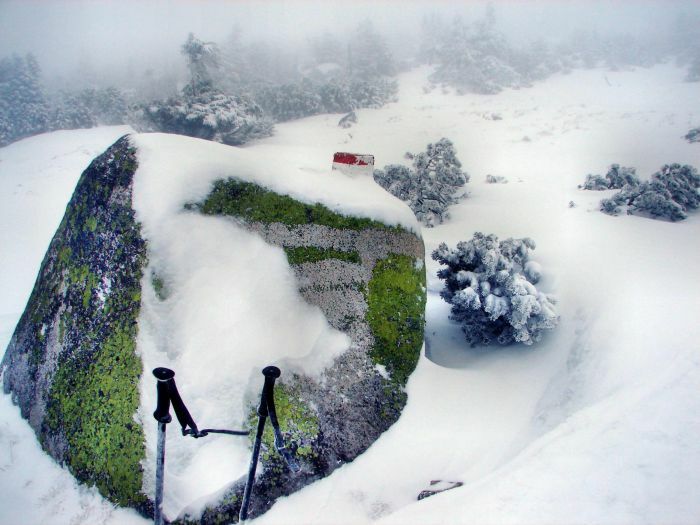 Karkonosze (also called Giant Mountains) are the highest and largest mountain chain in Sudetes mountain system. 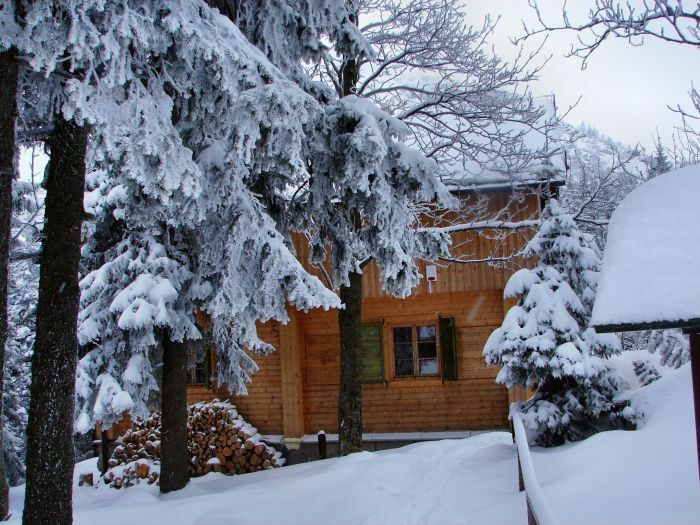 Located in the south - western Poland on the border with the Czech Republic. 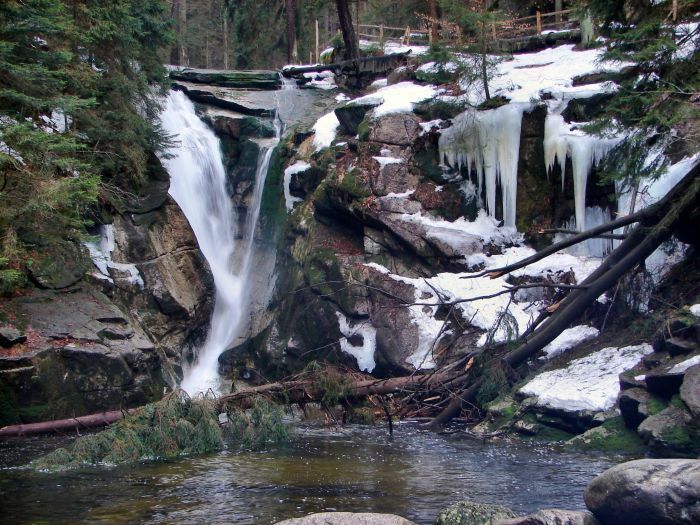 Karkonosze area is approximately 650 km2 of which over 2/3 is located on the Czech Republic side. 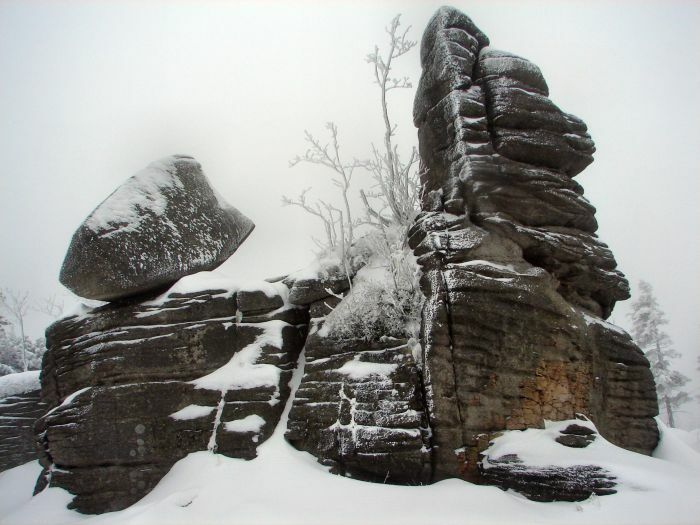 But the highest peak Śnieżka (1602 m. above sea-level ) and many attractions such as Śnieżne Kotły (glacial cirques called: Snow boilers), most interesting rock formations, waterfalls are located in the Polish part of Karkonosze. 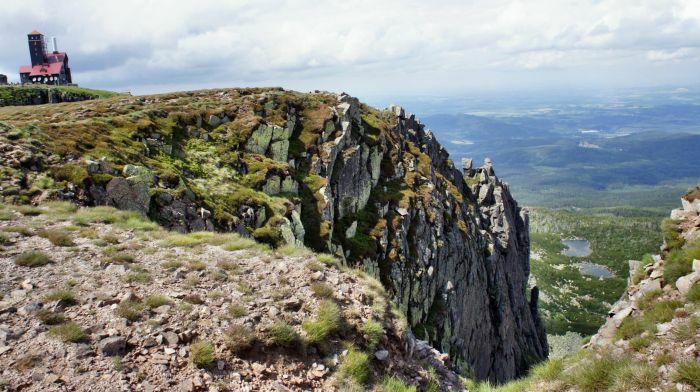 The entire Sudetes mountain system, thus also Karkonosze are the oldest mountains in Poland. 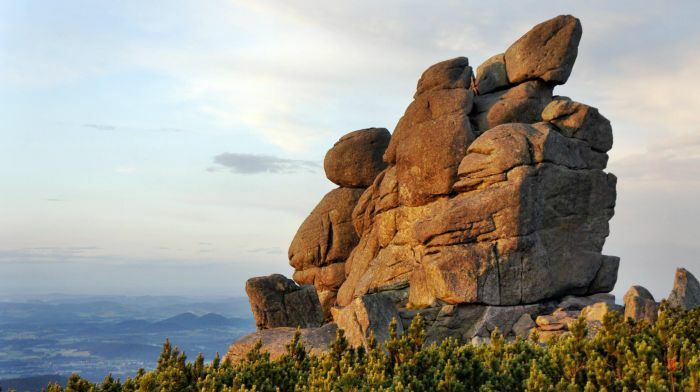 Formation of the Sudetes has started in the Precambrian era about 650 million years ago. 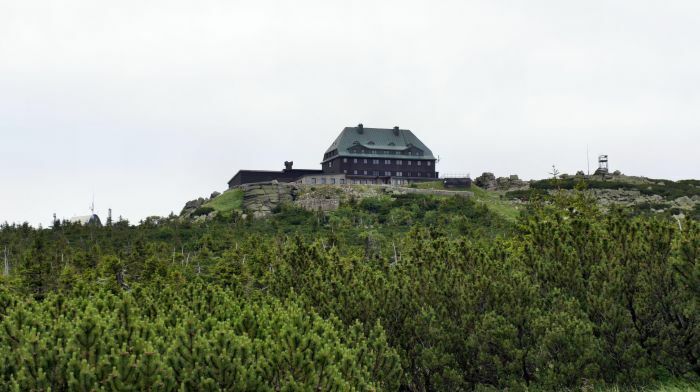 Currently, the entire main ridge of the Karkonosze is subject to strict protection. 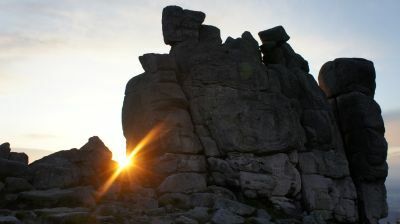 In 1933 nature reserves were established. They included glacial cirques: Śnieżne Kotły (Snow Boilers), Kocioł Małego Stawu (Little Pond Boiler), Kocioł Małego Stawu (Great Pond Boiler). 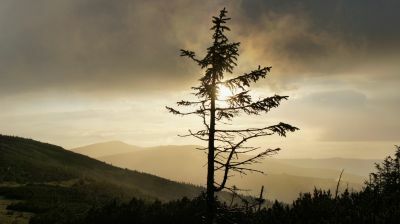 The Karkonosze National Park was established in 1959. 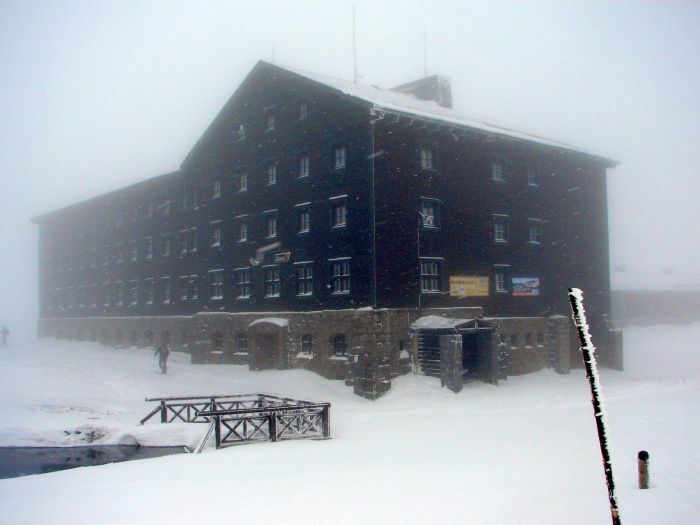 Karkonosze has probably the best developed and extensive network of shelters in comparison to other mountain ranges in Poland. This is caused by the fact that over the main ridge runs the state border, so Poland has a lot of shelters on its side and the Czech Republic as well. I counted 16 shelters on the main, red marked trail, (within half an hour away from the trail in both directions) from the Szrenicka alp to Okraj pass. 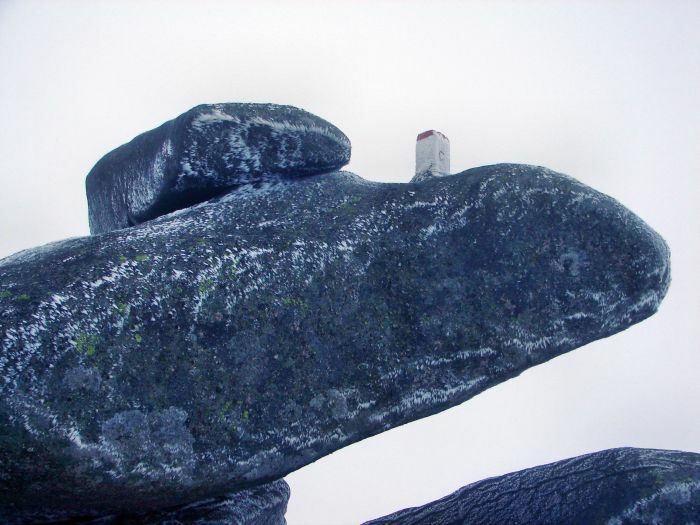 A curiosity encounter at the main trail are imaginative state border posts. 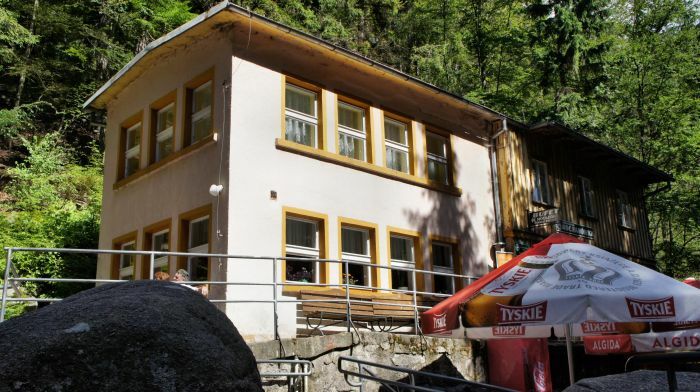 Kochanówka hostel is located about 10 minutes from road: Jelenia Góra - Szklarska Poręba. From the main road You should follow black marked trail. You can take a bus from Jelenia Góra - journey takes about 40 minutes. Next to the bus stop is also a parking. 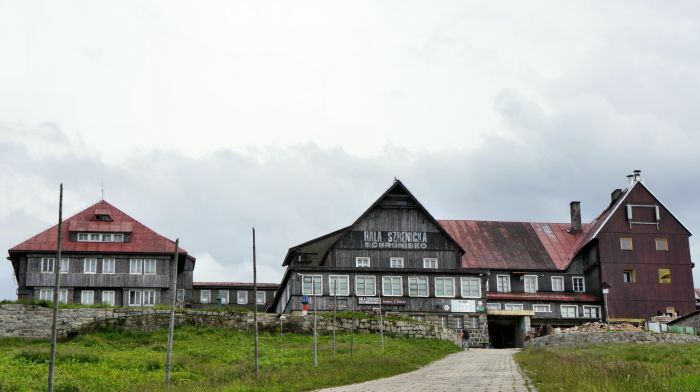 Kochanówka hostel was founded in 1868 - originally functioned as a pub, called Kochellfalbaude. 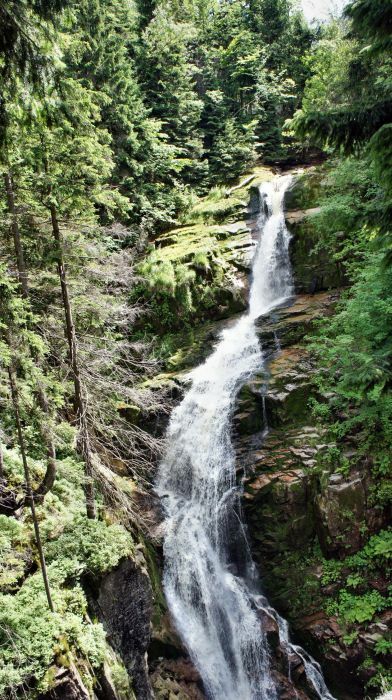 Near the hostel is located waterfall Szklarka - 13 meters high. Such environment makes that spending night in Kochanówka is very attractive and somewhat romantic. 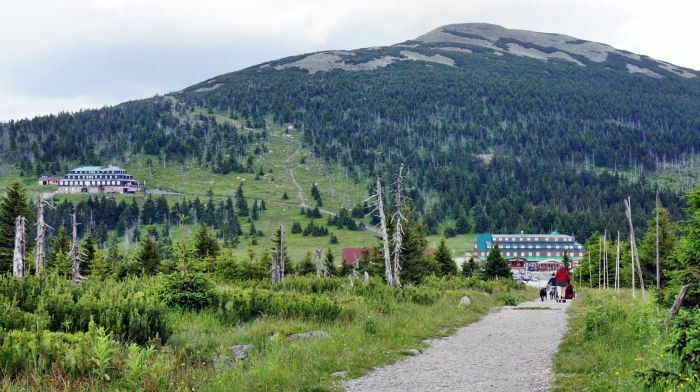 Our trail starts at the waterfall and is black marked (paralel to the black trail there is also blue trail, which is quite boring and leads directly to the hostel under Łabski peak, but we have to follow the black marked trail). The first stage of hiking leads through forest along Szklarka stream. After about 20 minutes, we go out into the open space, there are the first buildings. We have to look for carefully signs to Old Walloon Cottage (Stara Chata Walońska). Old Walloon Cottage is placed on the right side of our trail, but it is quite inconspicuous and easy to miss. 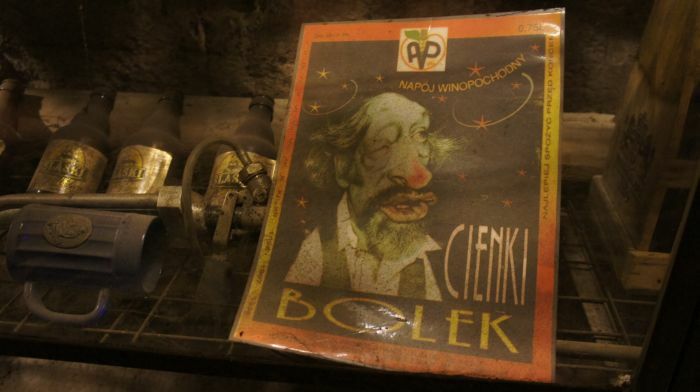 Old Walloon Cottage is worth a visit, because there is lot of attractions: the opportunity to visit the underworld - numerous original exhibits as skeletons, animal antlers, a collection of beer and wine bottles from the communist era, with interesting names; collection of rocks and minerals found in Karkonosze; the possibility of self- making the personal Walloon amulet. 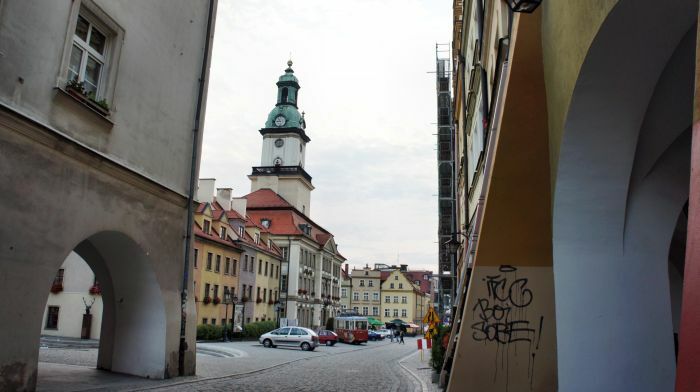 This trail will take You to Kamieńczyk hostel within about 40 minutes. 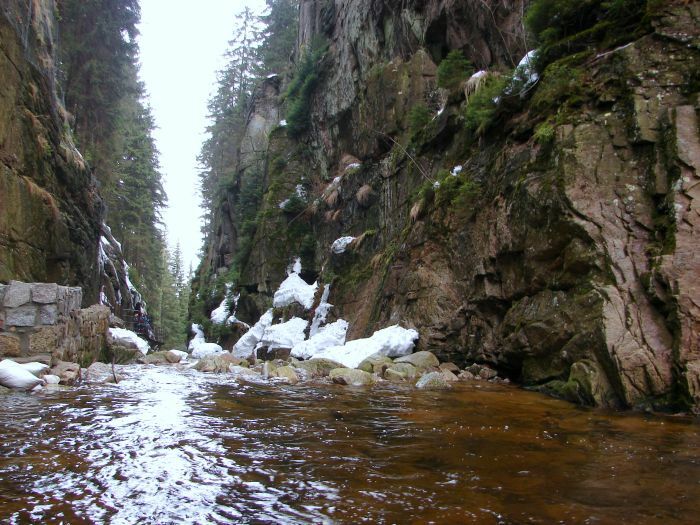 The route leads along the gorge, at the bottom flows stream called Kamieńczyk. Along the way, near the shelter is a descent into the gorge and waterfall. The descent is paid and helmets are mandatory. In 1973, here was an accident, a stone hit and kill the tourist, after that, descent to the waterfall was closed for many years. 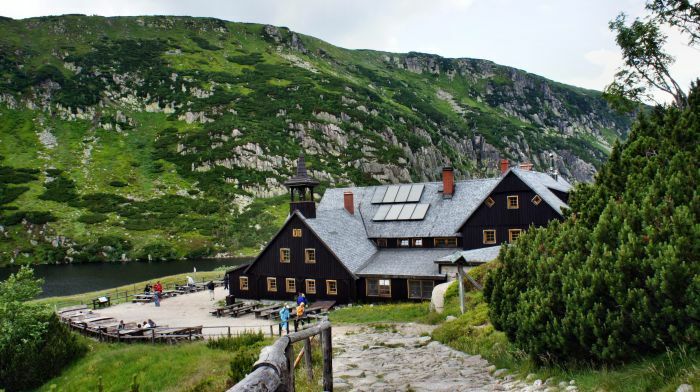 At the Kamieńczyk hostel You can relax, there's a viewing platform - You can admire Karkonosze mountains and Kamieńczyk waterfall. After the rest and taking a photo You have to hike further along the red trail. 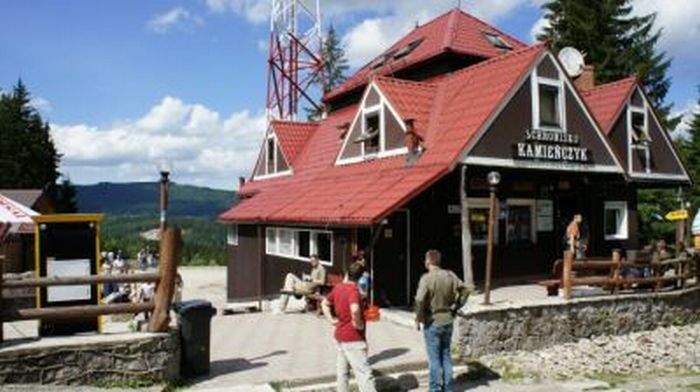 After a few minutes You will reach the cash point - where you have to buy an entry ticket to the Karkonosze National Park. For about 45 minutes we hike on pavement following the red trail (however path is very wide and there is no way to get lost) to the next point - Szrenicka Alp. There is a hostel with a powerful silhouette, offering 110 beds. From here is close to the next hostel - Szrenica. From the alp You have to still follow the red trail - after about 20 minutes there is a crossroads, here we can see black marked trail which turns left - this black trail will take You to hostel Szrenica (within 5 minutes). Of course, if You don't need a rest, You can not turn the left and follow red marked trail. 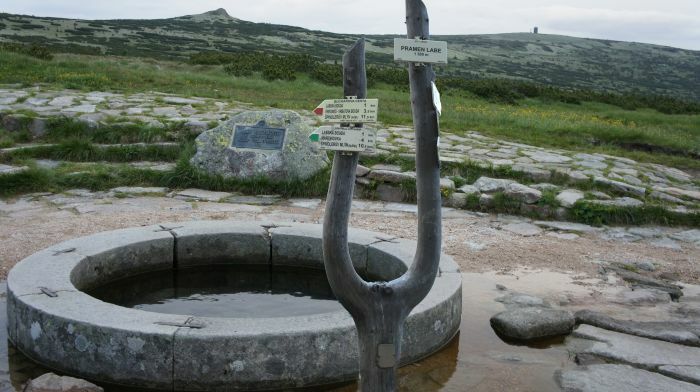 The entry to the peak Szrenica (1362 meters above sea level) is not allowed. This area is under strict protection. which will take You to the yellow trail, then You have to turn the left on this yellow trail. 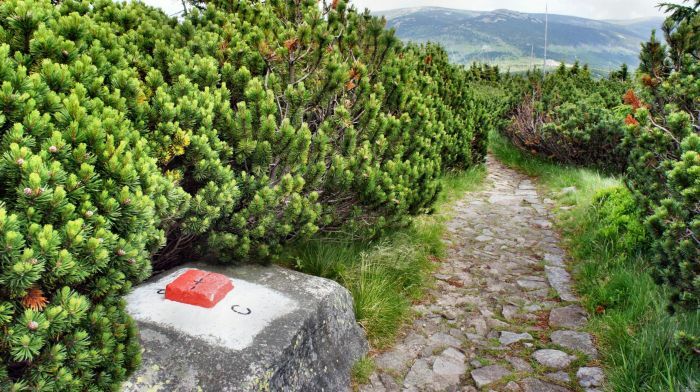 The route starts near the hostel under Łabski Peak - You have to follow yellow marked trail. 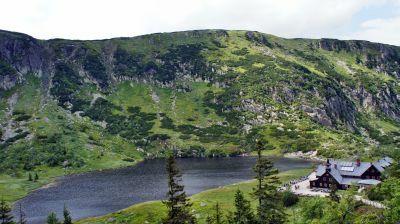 For about 1 hour we hike on the convenient path, trail leads on the slopes of Łabski Peak in the direction of Radio - Television relay station and glacial cirque Śnieżne Kotły. The trail leads up the hill, but the climb is gentle. The area is open, so you can admire views and take pictures. 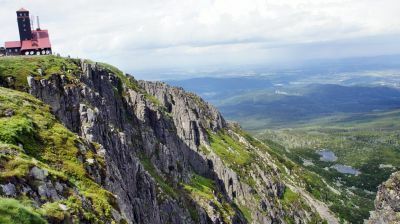 This climb and further parts of the route (especially when traversing the Wielki Szyszak Peak) is a bit like in Low Tatras - Chopok region. 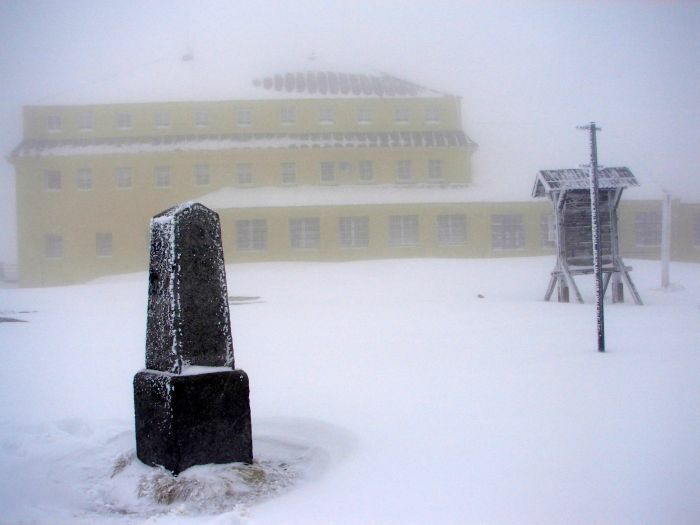 TV relay station does not have accomodation, there is no buffet, but in extreme circumstances when is a risk of life, the station is obliged to take tourists to stay. 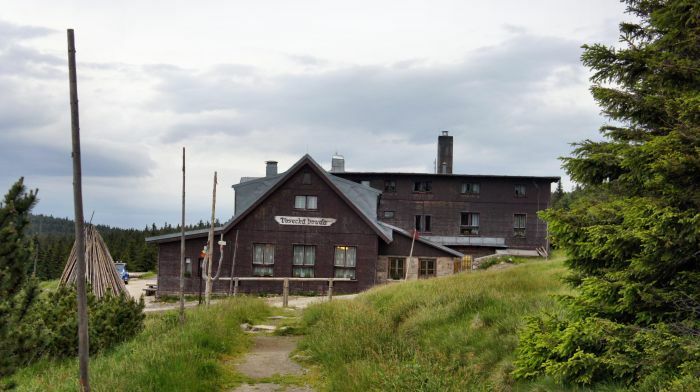 It is interesting, that in 1837 there was a small hostel (founded by the owner of this area - Count Schaffgotsch), which only in 1961 was taken over by Radio - Television relay station. Glacial cirques: Mały i Wielki Śnieżny Kocioł (Small and Great Snow Boiler) are one of the biggest attractions in Karkonosze. I would say, these glaciers are the characteristic "souvenir" from ice age . The walls are over 200 meters high and at the bottom there are Śnieżne Stawki (Snow ponds). 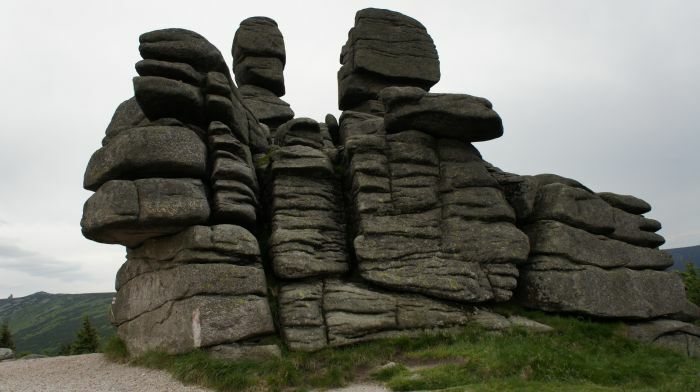 The described glacial cirques area is under strict protection. 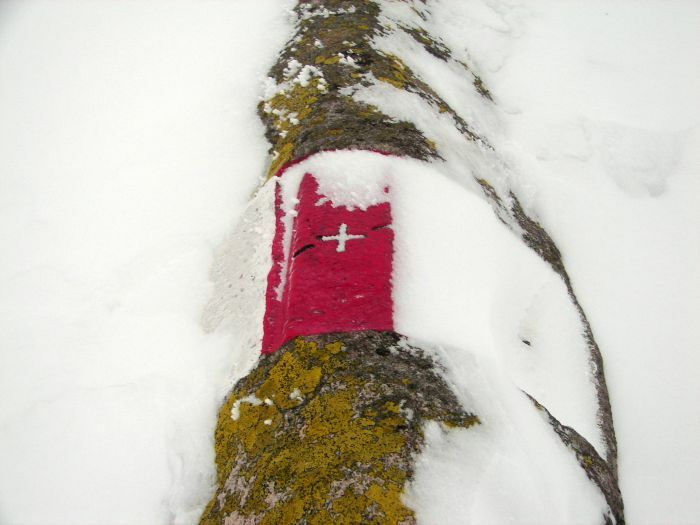 After admire of beautiful views, You have to continue along the red marked trail. 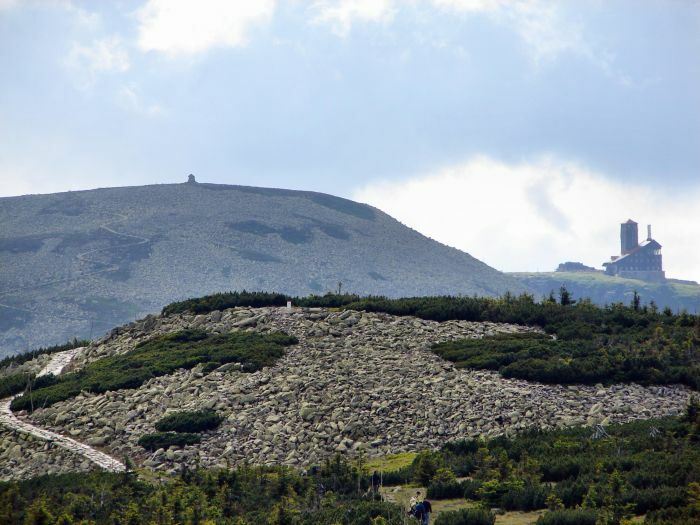 You have to traverse Wielki Szyszak Peak (1509 meters AMSL) - the second highest peak in Karkonosze. If anyone wants, you can climb to the top - at the beginning of the trail, just after glaciers, you have to look for informal path turning right. 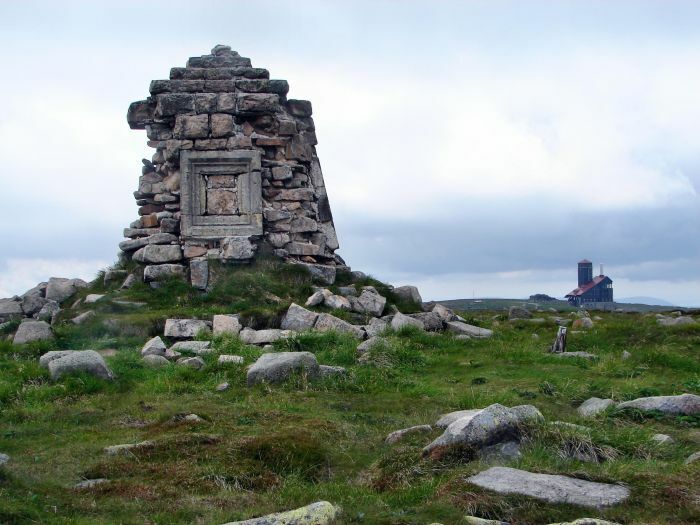 At the top there is a monument to commemorate the reign of Emperor Wilhelm I . The return is along the same path back to the red marked trail. 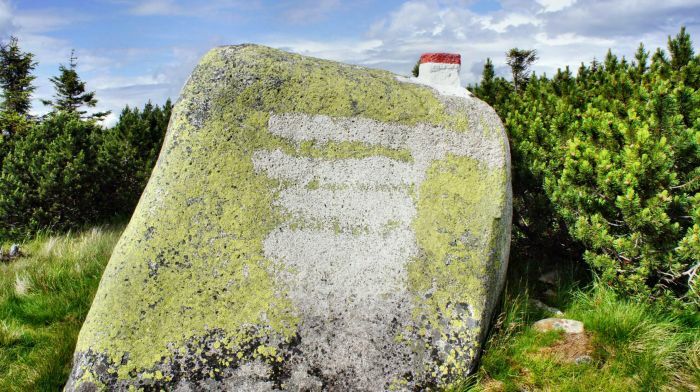 We walk the red trail on the main ridge of Karkonosze (on the way we pass numerous rock formations: Czech Stones and Silesia Stones, in the Czech language called: men's and women's stones) for about 1.30 hours to the point where the asphalt begins. There is a closed (in 2011) Petrova bouda shelter. All the time we have to follow red trail which leads along the said road. 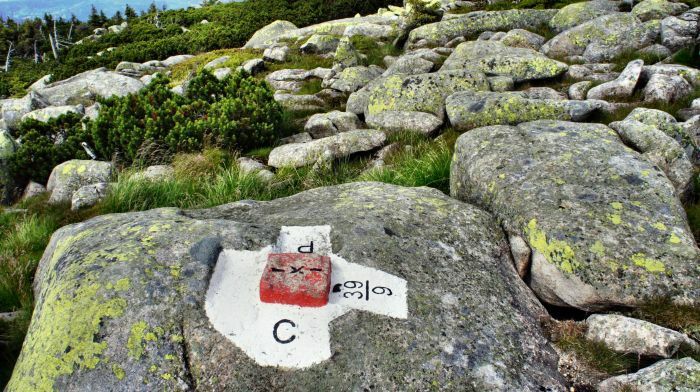 After half an hour You will come to Karkonoska Pass. On the pass are three buildings: the former military outpost - now 4 star Czech hotel "Depandance", the luxury Czech hotel Spindlerova bouda (up to 2006 it was a hostel, and now it is the object with a swimming pool, sauna, where accommodation costs about EUR 35 in low season) as well as Polish hostel Odrodzenie ( the name means 'Revival'), one of the largest shelters on the Polish side of Karkonosze - offering 112 beds). After a rest and a meal in hostel, You have to continue trip along the red trail. After over an hour we get to the characteristic point - the rock called Sunflower (It is interesting that near Sunflower there was a large shelter, called Prince Henry shelter, unfortunately, burned down in 1947). 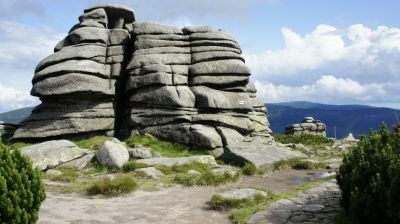 Here starts the yellow trail - if you have enough power and more than hour of free time, You can go down following the yellow trail to watch a group of rock formations called Pilgrims and return back to the red trail. Next part of our route takes about half an hour from Sunflower rock, You have to follow the red marked trail. 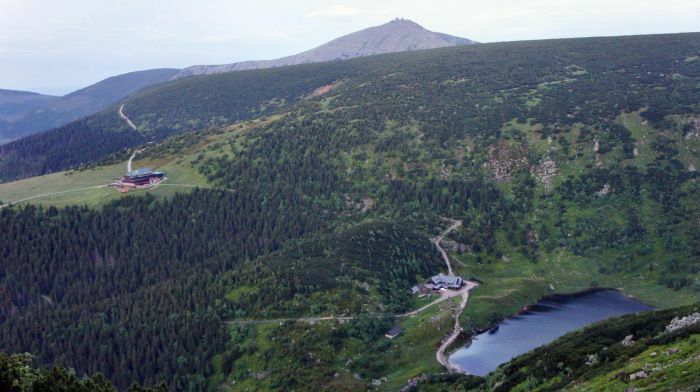 This part is wonderful, as we walk along the ridge, on the left side, down, we can see Big and Little Lake and hostel Samotnia (means Solitude). When you will reach the blue trail - turn left and follow this blue trail - it takes about 20 minutes to the Strzecha Akademicka hostel. 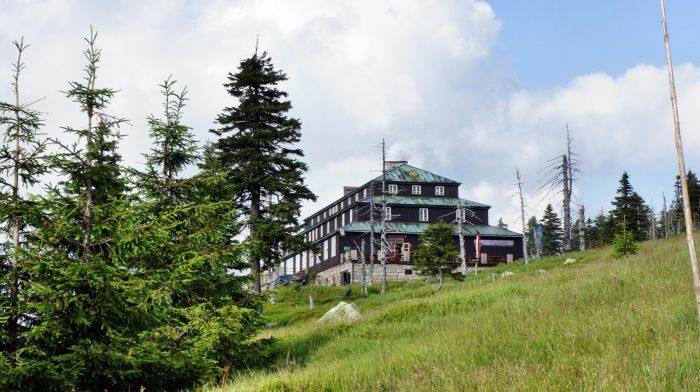 The planned route is short - because we go back home (you can continue the trip and climb on Śnieżka (1602 AMSL) - the highest peak of Karkonosze - about 1.30 hour climg from Strzecha Akademicka shelter). From Strzecha hostel we go along the blue marked route for about 20 min to the Samotnia hostel. 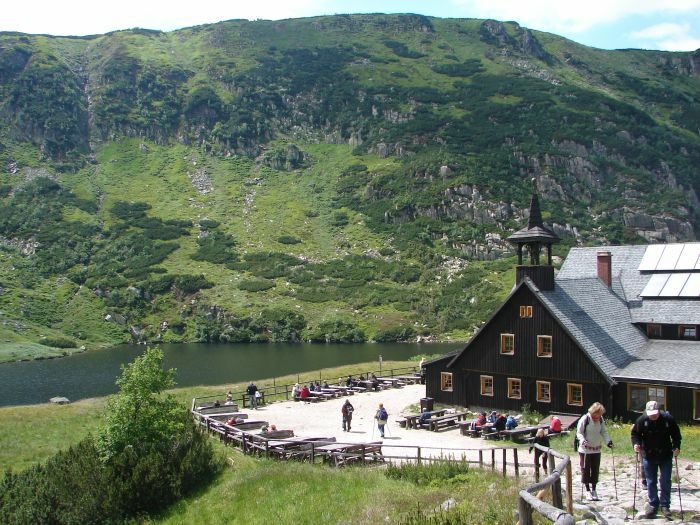 It is one of the most beautiful hostels located in Poland. 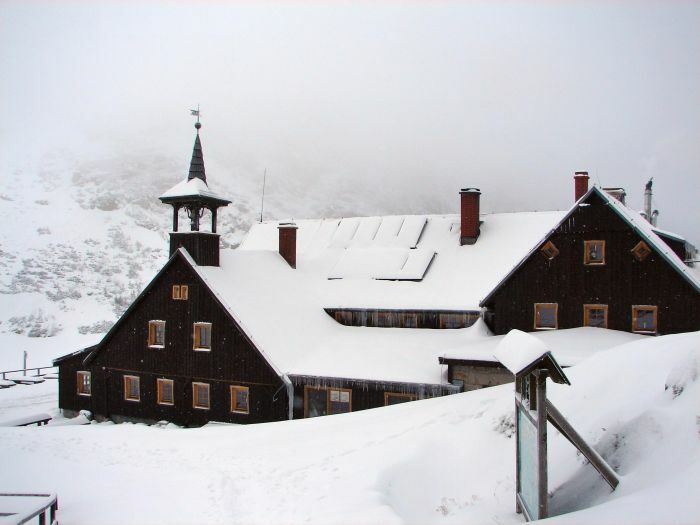 The walls are up to 200 meters height above the mirror pond, numerous avalanches come down in winter time, so that winter night in this hostel, when avalanches are falling with a vengeance on the icy surface of Little Pond, can be an unique experiance. In spring and summer you can sit at the tables, close to the pond. Prices in Samotnia are relatively high. After the rest, enjoying the views You have to follow further the blue route, partially on banks of a Small Pond. 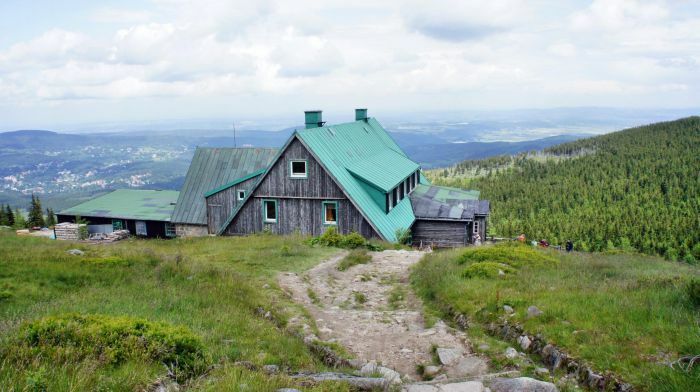 Along the way, you can see Hunter's House - it belongs to Karkonosze National Park. After about 40 minutes You will reach the cross with the yellow trail (yellow trail goes to the left - 25 min. to the rocks Pilgrims). 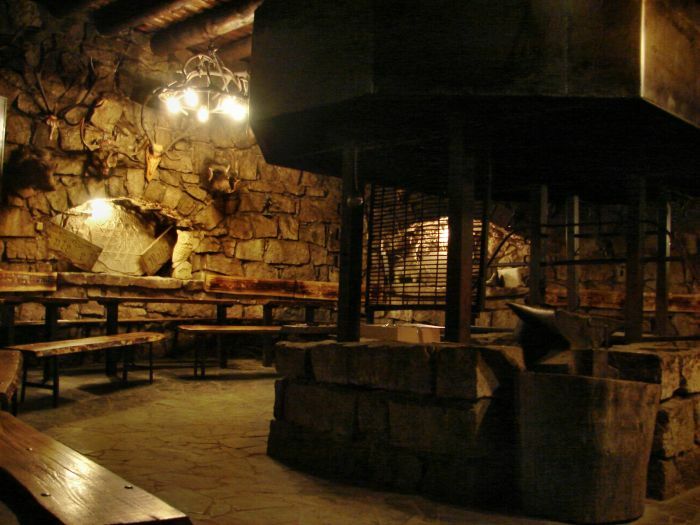 This place is called Polana - Glade (in the past here was a large shelter), there are benches and tables, so with own lunch, you can arrange the camp. We go slightly to the right, following blue marked route, after about 35 minutes we get to the temple Wang. Interestingly, the temple Wang comes from the twelfth-thirteenth century and was built in Norway. 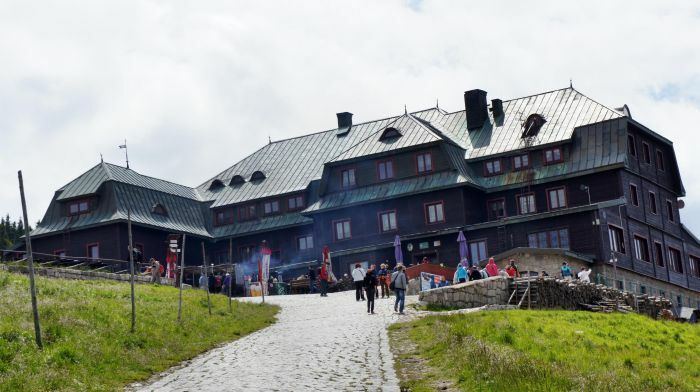 In the nineteenth century, was purchased by King of Prussia - Frederick William IV and transported to Karpacz. The main transport hub in Karkonosze is Jelenia Góra town. Buses and trains from various places in Poland run here. 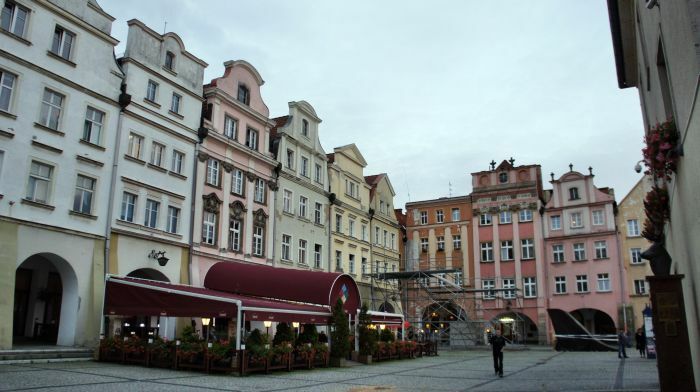 Jelenia Góra has a good connection to bigger city - Wroclaw. From Wroclaw to Jelenia are some buses a day. 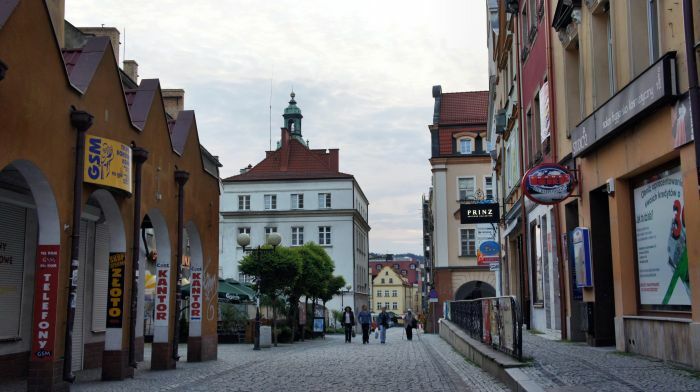 From Jelenia Góra You can easily get a bus to the mountain towns: Szklarska Poręba and Karpacz. If You have a few hours of free time, e.g. 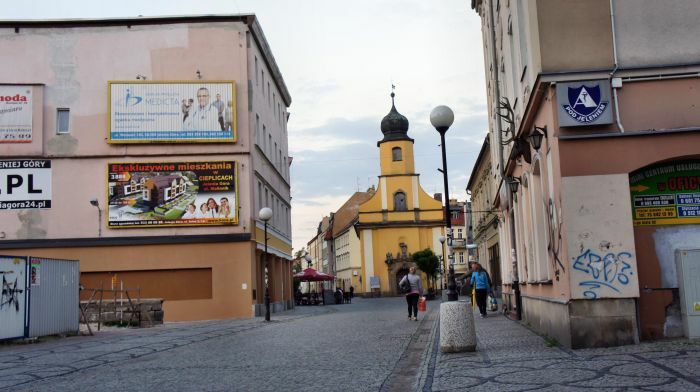 waiting for a bus, You can take a walk in the Jelenia Gora. 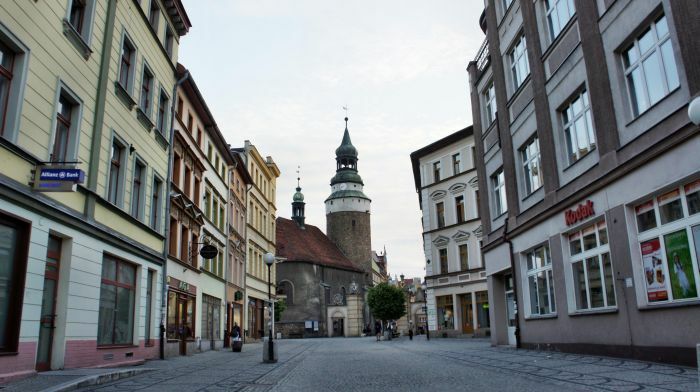 It is one of the largest cities in the Lower Silesia region (Dolny Śląsk), the traffic is routed edging, so the city center is very calm and walkers friendly. 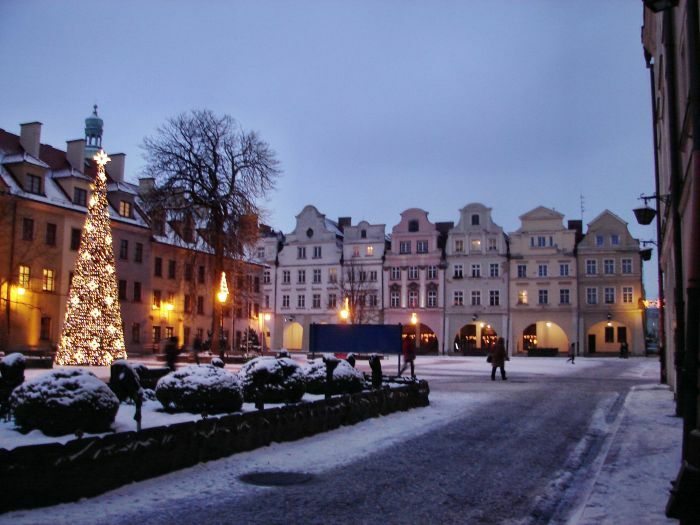 From the railway station and bus station to the old market, there is about 15 minutes walk. 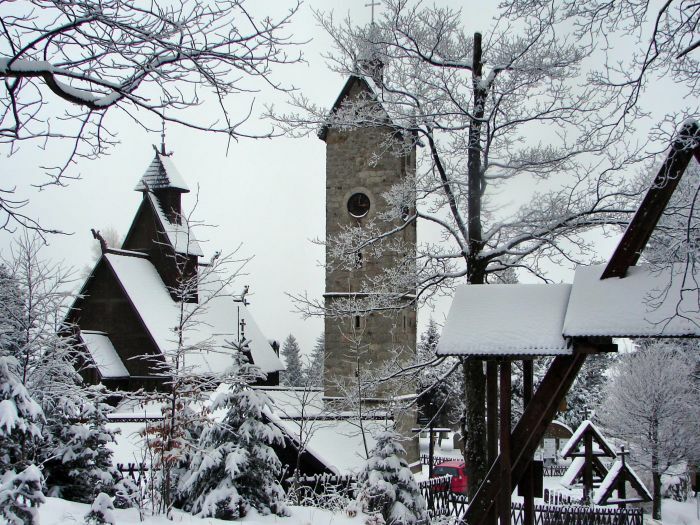 Szklarska Poreba and Karpacz as a typical tourist towns have a well developed accommodation base. Many little hotels, guesthouses and private accommodation offer something for everyone. 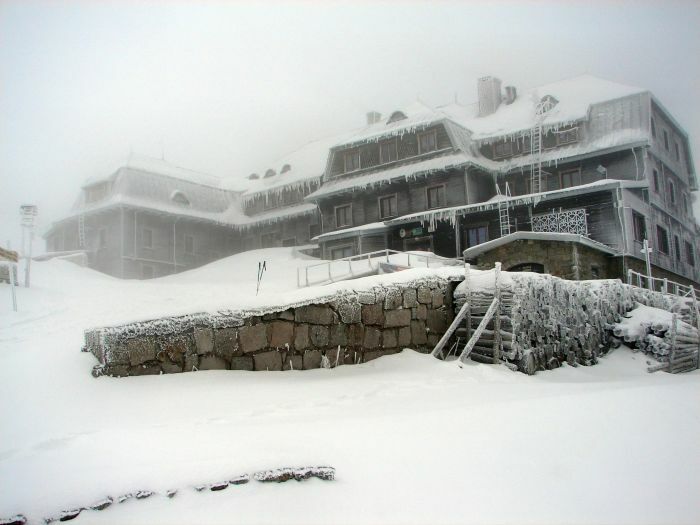 I don't recommend anything, because we did not use the accommodation in these destinations, we slept in mountain chalets. An interesting alternative (depending on your time and approach routes) is an accomodation in Michałowice and in the ruins of Chojnik Castle.